Chester Cheetah is about to meet his more saccharine cousin (Chester Sweetah? 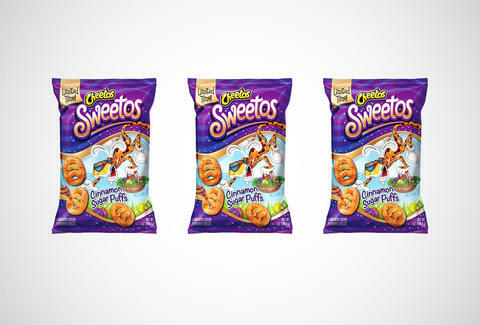 ), because Cheetos are going to be available in a brand-new sweet variety called -- what else? -- "Sweetos." The cinnamon sugar-dusted snacks will be available starting in late February, and won't come in the traditional Cheetos shape, but rather will resemble Easter eggs, owing to the fact that they're a limited-time offer ending in mid-spring. Essentially, they're small, bagged churros. This is the first time Cheetos have been available in a non-savory flavor. And hopefully it's not the last. Adam Lapetina is a Food/Drink staff writer for Thrillist, and looks forward to a lot of cinnamon sugar residue. Read his musings at @adamlapetina.